BCP's stocks have gone down by 4% this session, increasing to 15% the accumulated loss that has been registered over the last six sessions. Almost €600m in market value "vanished". BCP Bank has been under intense pressure over the growing political and budgetary disagreement between Italy and the European Union. The banks’ stocks suffered a considerable loss during this Monday session, raising the bar to a loss of €600m in market value, in only seven sessions. BCP’s stocks went down by 4.01%, to 22,41 cents, which is a new low (last time they were this low was September 2017). This is the sixth session in which the bank has suffered losses. 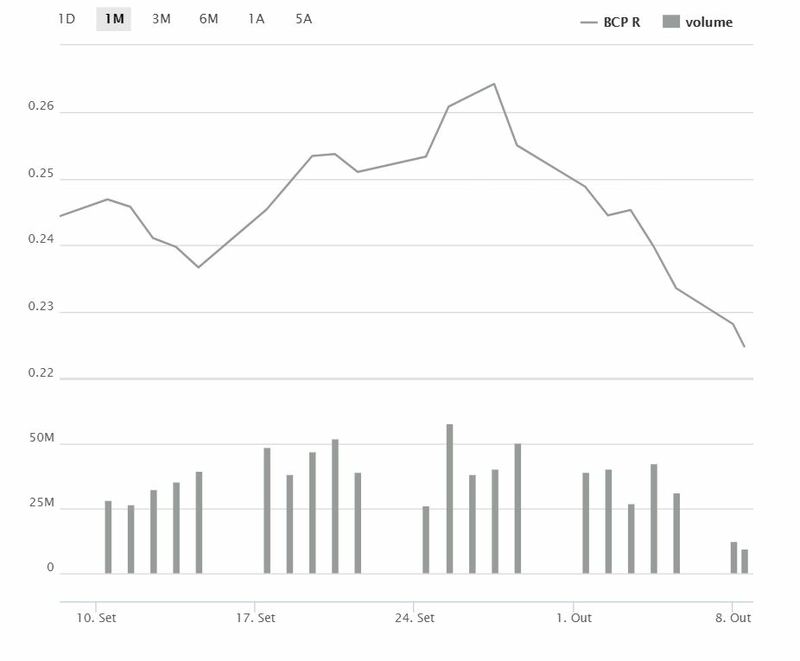 Since the 28th of September, BCP has seen its value decrease by 15%. In terms of market capitalization, BCP’s value shrunk by €606m over that period. The bank, which is headed by Miguel Maya, hasn’t been able to face the strong tidal waves coming from Italy’s debt crisis over the last couple of days. Giuseppe Conte’s government has shown to be unstable on both the budgetary and the political level, with the rising tension between Italian leaders and European Union’s leaders scaring away investors, which menaces the stability of the Italian market, and on a second level, further aggravating the interest rates for the Italian government’s debt. This Monday, the ten-year interest rates for Italian government debt reached new record highs, which made Milan’s stock market register a 2% downward fall. Inevitably, BCP ended up being infected by the sudden turbulence, which explains their market loss over this session. Italy’s main European peers also registered severe losses. Europe’s securities fell by 1.5% with UBI Banca and Commerzbank being those which recorded the highest losses, falling by 5% in this session. This Monday, the markets are yet again paying special attention to the signs coming all the way from Italy. Italian vice prime minister, Matteo Salvini, in a conference held together with Marine Le Pen, denounced the president of the European Commission, Jean-Claude Juncker, and the European commissary for the Economy, Pierro Moscovici, as Europe’s enemies. He also stated that his government would not give in to the pressure from the market, and it wouldn’t back down from increasing next year’s budget deficit. “Each side’s views are reinforcing the idea that there will be a head-on collision between Italy and the European Union over the budget deficit”, Martin van Vliet, strategist of ING, told Reuters. Portuguese exports went up by 10% and imports went up by 13.1% in 2017 in comparison to the previous year, reaching new record highs in terms of exchanged values.